Hiring new employees for the busy season can be very stressful for employers. There are so many things to keep track of: names, dates, departments, pay rates and more. It can be quite overwhelming! The Request Form gives you everything needed to be prepared for hiring new employees. 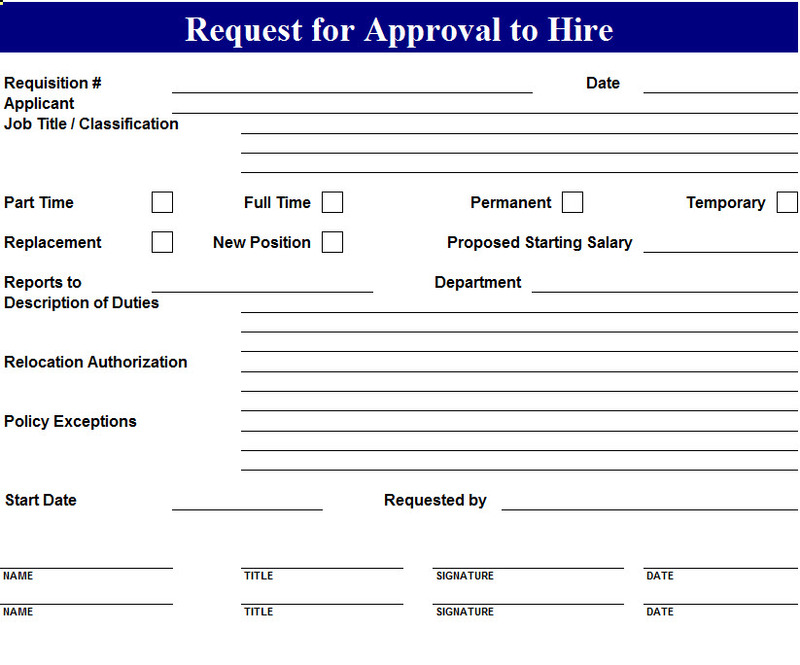 The Hire Form is a simple and free template that allows for quick customization. Every second counts, so make your work life easier with the Request to Hire Form! After downloading the file below you’ll be able to see the simplistic design that only requires you to enter the important information. Everything you need to stay organized is located on one page, no hassle! Once the file is open you can start to enter the employee information. The top few lines list basic topics required for most businesses, such as: the applicant name, the date, title/department, and a requisition number. The template includes a helpful checklist to inform you what types of employment they are applying for: full time, part time, temporary, and much more! There is also a section for you or the applicant to mark a proposed starting salary. After reading through the various other sections and entering in any notable information, all that’s left to do is sign and date at the bottom. There are lines for both the employer and the applicant to sign. After you have finished typing the information you can print the document by clicking on the “File” tab at the top and selecting “Print”. You can also print as many blank copies as you need and write down the information so you’re always prepared! Why Use the Request to Hire Form? You have a busy schedule, we all know it. This free template takes away some of the unnecessary busy work. The Hire Form provides a free way for you to organize all of your new hire information and informs you on important data at the same time. You can start to make more educated decisions based on pay rates and department preferences. Don’t lose another minute to paperwork! Get this template today!